Painted by renowned architectural painter David Hepher, this significant work was recently gifted to Sheffield Cathedral. The painting is important because it documents the cityscape of 1950’s and 60s Sheffield, at the very moment when back-to-back housing was being taken down, and large blocks of flats were being built. It is also one of the very few religious works of art by Mr Hepher. David Hepher is a renowned architectural painter, and his works have been collected by many prominent institutions such as the Museum of London, Tate Britain, the Arts Council, the Victoria and Albert Museum, and the Museum Boymans-van Beuningen in Rotterdam. The painting entitled ‘Christ Over Sheffield’ was commissioned from David Hepher by the Vicar of St Chad’s Church, Woodseats. David Hepher’s father was Vicar of St Stephen’s Upperthorpe and the painting is taken from a high point in the parish looking on the landscape as it was in the late 1950’s. Christ is portrayed on the cross with Sheffield as the backdrop hence the title, ‘Christ Over Sheffield’. The picture hung in St Chad’s for some years and during reordering of the church the painting was put in storage. The Church Council of St Chad’s offered to present it to the Cathedral. 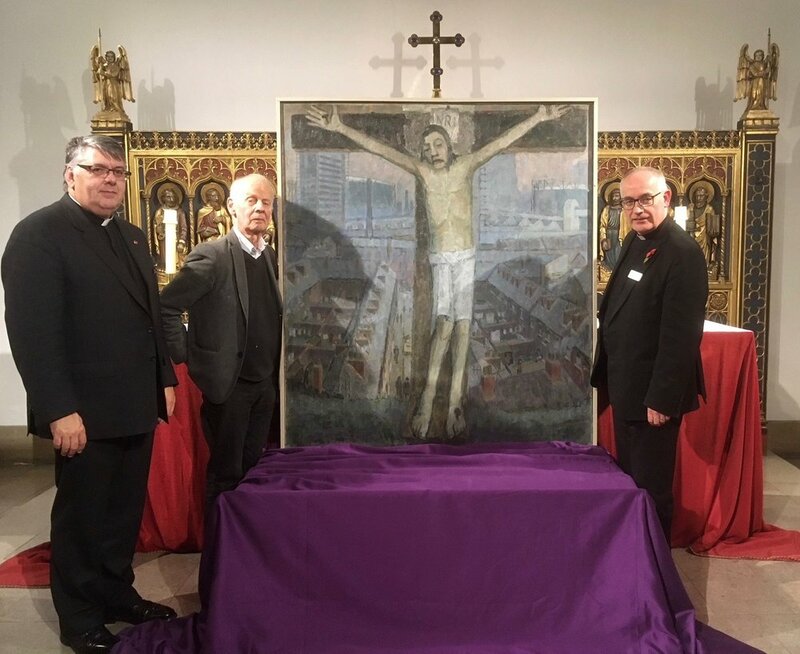 The Cathedral agreed to receive the painting and following an appeal at a special event where David Hepher was present all the money was raised to restore and reframe the painting. The painting will be permanently on show in the Westend of the Cathedral and so will be on view to visitors.